This post was in partnership with searchRx. All opinions are 100% mine. 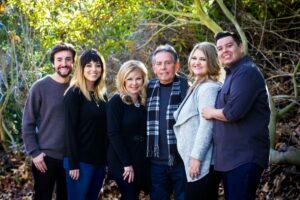 In the new year, it’s a common goal to want to find easy ways to save money every month, cut back on expenses and try and put money away for future needs. Some of you may know that both of my children are getting married this year so I have a lot of incentive to do so! Here is my growing family with my future son-in-law, my daughter, me, my husband, future daughter-in-law and my son. Blessings ahead! I’ve been going through bank statements and canceling many of the subscriptions to services we can do without, trying to do a better job with meal planning and food shopping, and we are on a cash budget for entertainment. We have set a limit and once it is spent, it is Netflix and popcorn time. 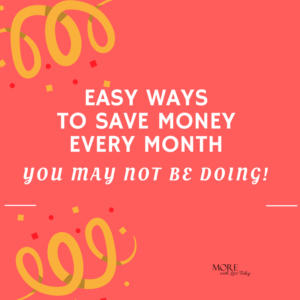 Through my research, I came upon searchRx which is a free site and quickly got added to my list of easy ways to save money every month. You will see at a glance the lowest discounted prices on over 50,000 prescription drugs. At my house, we refill a fair amount of prescriptions each month and we do it at the same place all the time without giving a thought to comparing prices. Head thump! Once I took the few seconds to plug our prescriptions into the searchRx site, I quickly saw the potential savings I have been missing. 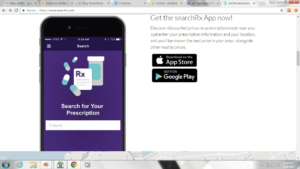 On their website or through their free APP, you’ll see the names and addresses of your local pharmacies displayed as well as the current prices for the medication you typed in. 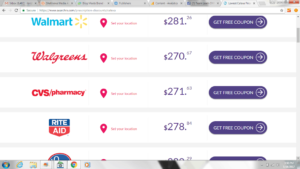 SearchRx is accepted at 62,196 pharmacies including all of the major chains. Just by checking the prices of the medications that we take, I can now save about $50 a month by having them refilled at a different local pharmacy. That will add up over the next year and will help me pay for the next Christmas season when I will have two new family members! Did you know that the average family spends over $1300 a year on filling their prescriptions? I know many people who spend much more than that and have medications that cost over $100 a month each. I learned that two of the largest companies, Express Scripts, and CVS Caremark have recently published a list of drugs that will not be covered in 2017 which means we will have to pay full price for them. If your prescriptions are no longer being covered at all, be sure to check searchRx. If you are loyal to a particular pharmacy, why not show them the competitive prices near you and ask them to price match? It is worth a try. When you see how easy it is to find potential savings, there is no reason not to check your options. searchRx is as free and there are no hidden fees or any fees for that matter. You will absolutely NEVER be charged for using the searchRx service or affiliated coupons. searchRx has partnered with a leading pharmacy benefit manager, OptumRx, who has negotiated discounted medication prices through bulk buying. Because our discount program isn’t insurance, it’s free. They collect a bounty from the discount awarded from big pharmaceutical companies, but NEVER from you. It is accepted at over 62,000 pharmacies including CVS, Rite Aid, and Walgreens. Bring both your insurance card and your searchRx coupon to your pharmacist and ask to see which provides a more cost-effective option for you. If for any reason your pharmacist does not accept your coupon, please call them 24/7 on their pharmacist help line at (1-866-618-4723) and they will be glad to help you. Savings are available on both brand name and generic prescriptions. Prescription prices can change daily, and the same medication can vary greatly in cost from one pharmacy to the next. The pricing tool (available online and in the APP) is a great way to find the best rate within a given zip code. Use it before every refill. With some drugs, you will see lower discounts, and there may be times when no discount is available. That said, just because little-or-no discount may be available on one occasion, does not mean that a different drug or a different pharmacy won’t come back with a better discount when it’s time to fill the next prescription. If your pet is on medication for antibiotics, ear and eye medications, thyroid medications and more, ask your vet to write your pet’s prescription for the human equivalent, compare the prices on searchRx and save the most you can! You should also check out SingleCare, similar to searchRx for up to 80% savings on dental and vision care, video doctor visits and additional savings on prescriptions. What will you do with the extra savings? Come back and tell us how much you saved on your prescriptions. What a great way to save money. Medicine is so expensive so this is great. We have insurance, so we only pay $5 when we need medications. I hear they can really pricey…. This is such a great idea to save a lot of money. Thank youso much for sharing this info! This is really interesting. I had no clue that different stores charged differently for prescriptions. I will use this tool to try and save money. Wow, how awesome! I never knew about this. I’m always down with saving money. Good thing there is a free APP that can let us see and choose the names of our local pharmacies as well as the current prices for the medication. We can save a lot from getting the cheapest price for its generic drugs. These are great tips for saving on prescriptions! I know prescriptions can add up fast especially monthly needed ones. Great tips! Didn’t know there is a useful app like this. a lot money can be saved by this. Thanks for the tip! A nothing I can do to save money is always great in my book. Im looking to buy a house this year so I really need to sort my finances out! This a lot of great information. Luckily we don’t have to spend any money on prescriptions but I know a lot of people who do and I’ll pass it along to them. It’s always nice to be able to save money. I try to cut costs as much as I can so that we have money for the more important things like medicine. It’s sad that there are new drugs that won’t be covered. Thanks for the tips! This sounds like a great website for folk who need prescriptions. Fortunately we’re a pretty healthy family (and we have the NHS!) so it’s not needed, but yes, every penny counts! I use this app all the time. It’s amazing how much you can save, especially those without prescription insurance. Oh this is awesome! I need to start saving more money and I think these tips are perfect for doing that. Omg this sounds like one great way to save money!!! Prescriptions can be rather pricy so it’s nice to be able to save a bit! Oh this is perfect since I’m a big spender lols. Kidding aside, thanks for these helpful tips. I’m gonna keep them in mind. That is an excellent way to save a few extra bucks especially if you have pets.